It is usual for projectiles to combine characteristics in order to maximise the effect on the target. The term 'AP shell' (which should properly be APHE) is used to describe an essentially armour-piercing projectile which also contains some high-explosive (usually only a very small percentage of the projectile weight), intended to detonate once the armour has been penetrated. It is generally only worth doing this in larger calibres, although national practices have varied. In World War Two, for example, British AP shot for tank/anti-tank guns contained no HE, while the German equivalents did. More of a compromise is the SAP or SAPHE (semi-armour-piercing HE) shell, which is similar to an APHE shell but has thinner walls to provide more space for explosives, thereby losing some AP performance. Because of the necessity for a hard point to both APHE and SAPHE shells, the fuzes are fitted into the base. 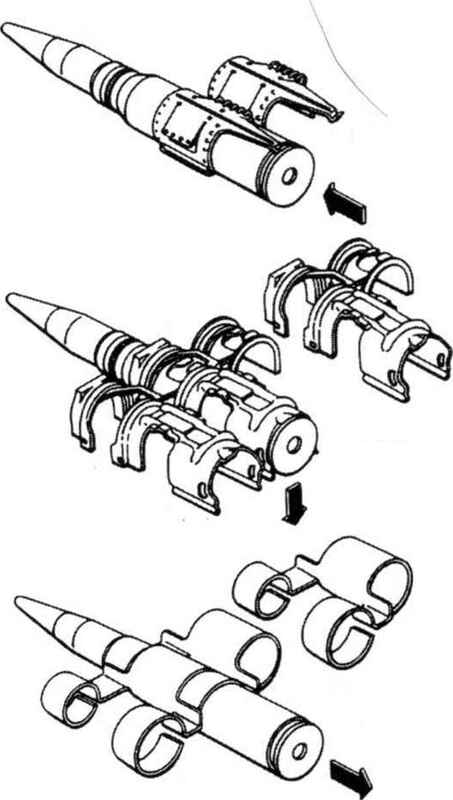 A common form of combination adds a tracer element to an HE, incendiary or AP projectile. These usually consist of a pyrotechnic element in the base of the projectile which burns brightly, enabling the trajectory to be followed and the aim corrected as required. These are obviously more effective at night so daytime tracers sometimes utilise a smoke trail. It is usual for the tracers to burn without emitting light for the first part of their travel ('dark trace'), partly to avoid blinding the gunner and partly to conceal the precise location of the gun. An originally unintended side-effect of tracers is psychological: the sight of a stream of tracers heading towards an attacking aircraft can distract the pilot. Ammunition designations now include 'HE/L (high-explosive and incendiary) and 'AP/I/T (armour-piercing incendiary tracer). It is possible for all of the above types to be combined in one multi-purpose projectile but there is obviously the risk that it will not be very effective in any of its tasks. The Norwegian firm Raufoss has been particularly successful in developing multipurpose (MP) ammunition which combines a chemical impact fuze with incendiary and HE elements - and even, in the .50" calibre version known as the NM140, some AP capability. This type has now been adopted by other countries for a wide range of ammunition, such as the American Olin PGU-28 round for the 20mm M61 series cannon and the British Royal Ordnance MP ammunition for the 30mm Aden. A more recent Raufoss development is the Mk 211 in 12.7mm calibre, which has a pyrophoric zirconium penetrator to ignite flammable material.